A hot water heater flush for sediment is an important maintenance item. This procedure can prevent sediment from building up inside the tank. There are three steps associated with this project that are outlined below: (1) 'Shutting Down the Water Heater', (2) 'Flushing a Hot Water Heater' and (3) 'Restarting a Hot Water Heater'. Not sure if this is your problem? See 'Troubleshooting Gas Water Heaters' and 'Electric Water Heater Troubleshooting' for a complete listing of all the water heater issues along with the related solutions. Why Should You Flush a Water Heater? The main reason for flushing a water heater is to prevent sediment build up inside the tank. See the article 'Hot Water Heater Sediment Problems' for information on why this can be a serious issue. The benefits of flushing the tank are increased efficiency for your hot water tank. Sediment build up reduces the amount of hot water you have. Heating the sediment will waste fuel and increase your utility costs. Heating elements inside of electric hot water heaters can be damaged by sediment. You can read the information below to find out what you need to do to get rid of it. Replacing your tank or a heating element can be expensive. Why go to all that expense when you can prevent it with a scheduled flushing each year. You should consider doing it annually. Do you have very hard water? You may need to do it more often. Fortunately, it is not a difficult or time consuming project. What Can You Save? - Not a hard job, but someone has to come out. It will probably run around $100 to $150. Not bad pay when you can get it. How Hard Could It Be? - Assuming your sediment is not deeply entrenched and hard, a water heater flush is a fairly easy job. These repairs will have a Difficulty Level of: Simple. These repairs require a Skill Level of: Job Jar Specialist. For and explanation of the terms in this section, see 'How to Use This Site'. Check the Simple Things! - This is already pretty simple. We can't make it much easier. What Can Go Wrong? - The water in your hot water tank is hot. Depending on the setting, you can be burned or scalded by it. You are dealing with water on this. Take precautions and make sure that the hose is tight and the drain is working. Keep some rags and a pail handy for any spills. Shutting down the hot water heater is essential. You cannot have the water heater firing up while it is being flushed. This is dangerous and can ruin the heater. The water inside the tank can be very hot. Turn on a hot faucet somewhere and run the water until it gets lukewarm. You do not want to get burned or scalded when you open the drain valve. Shut the faucet off when you are satisfied that the water temperature is safe. Imagine turning on the shower with not cold water mixed in. That is how hot this water will be if you don't mix in some cold. Water that is 150 degrees can scald you in less than a second. WARNING!! The water in your hot water tank can be VERY HOT. Make sure the water is cool before you open any valves. BE CAREFUL!!! WARNING!!! For an electric hot water heater there are some steps you want to follow that include shutting off the power. You do this at the breaker panel. The water heater breaker should be marked. Shut if off and put a piece of tape on it. See the article 'Shutting Down an Electric Water Heater' for the procedure that you should follow. On a gas hot water heater turn off the gas. The gas valve is located near the bottom of the tank. Turn the dial to the off position. You can also set it to 'Pilot'. You just want to make sure it doesn't fire up while you are flushing it. For instructions on the right procedure for shutting down a gas hot water heater, see the article 'Shutting Down a Gas Water Heater'. Flushing a hot water tank will not take long once you have the hose attached that leads to a drain. At the base of your hot water tank there is a drain valve with a threaded fitting on it. It is very similar to a spigot for your garden hose. You need somewhere for the water to go. A floor drain is perfect if you have one. A bathtub or a sink could work. The drain, sink or tub you choose should be lower than the drain valve. 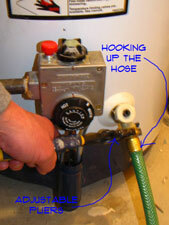 Hook the hose up to the drain valve and make sure it is tight. Put the other end of the hose in the location that it is draining into. Secure the hose and make sure it can't jump free when you open the valve. Check for leaks after you open the valve. Tighten things as needed and you are ready to begin. Open the valve to begin your hot water heater flush. Make sure the cold water inlet valve is on. You want fresh water running into the tank to purge it. Also make sure that other hot water valves and faucets are closed. The water coming out of the drain valve may be quite dirty at first. As the tank purges it should get cleaner and cleaner. You want to keep running water through the tank until the water is clear. Sorry, I know you wanted it to be harder, but this is all there is to a hot water heater flush. There is also a procedure that you need to follow to start up your water heater. Doing things out of order can damge the tank or other components inside the tank. For the correct procedure on starting up a gas or electric water heater, see the article 'Starting Up a Water Heater'. Remember, do not turn the breaker on or try to light the pilot light until you have followed these steps. Flushing a water heater is more of a maintenance item that a repair. It can be a repair for a electric hot water tank. Sediment can burn out the elements. Ten minutes to set it up, fifteen tops and another fifteen to clean up. That was all the work involved. You were probably able to do other things while the water was flushing out the tank. This won't be so bad, less than and hour once a year. Congratulations for completing your hot water heater flush.